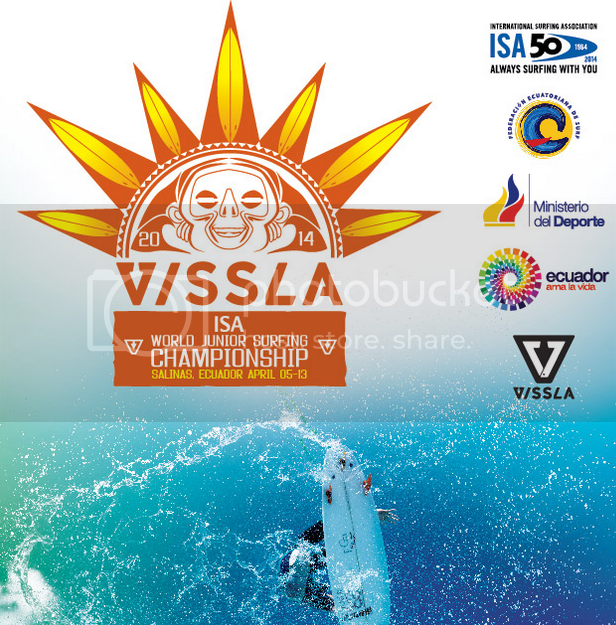 2014 VISSLA ISA World Junior Surfing Championship runs from April 5th to 13th at the left point break of La FAE in Salinas, Ecuador. Zac Wightman will be there representing Australia in the U16 Boys. Good luck mate. After 3 days of competition Zac is doing really well. He had a win in his Round 1 Qualify heat and 2nd in his Round 2 Qualify heat in fun 2'-4' lefts. All the surfers also get the chance to continue in the Rep Round if they drop out in a heat in the Qualify Round. Zac was unlucky to get 3rd today in a close one in his Qualify Round 3 and has moved into the Rep round. He can still win the event from here if he keeps getting through the Rep heats. A heat win in Rep round 4 has Zac still in contention. The surf was 2'-4' but is expected to get solid with the official forecaster of the event predicting a building swell on Saturday that will deliver 5-8ft waves with occasional 10ft+ waves on Sunday. Two good heats for Zac today progressing through Rep 7 and Rep 8. Unfortunately his great run came to an end in Rep 9. Zac finished 8th overall in the World Junior Titles. Congratulations mate.